It has been a little while since I took the time to pull together a fashion oriented post. 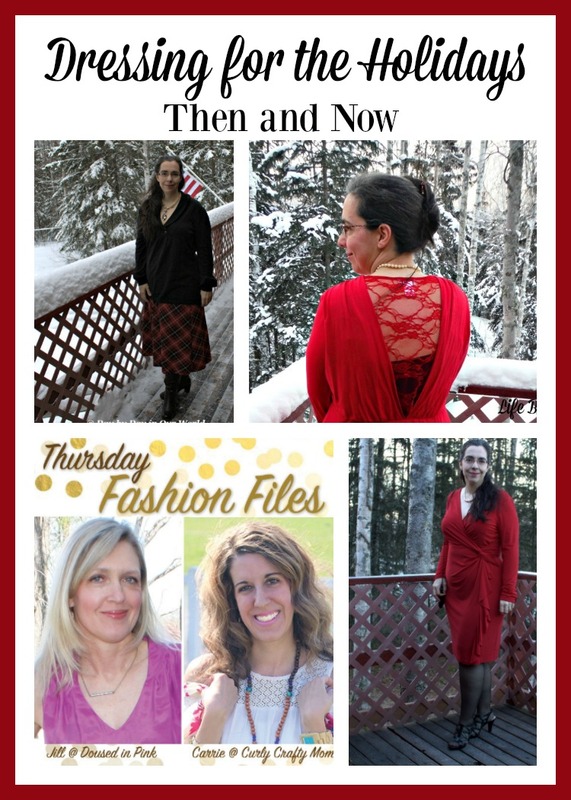 With holiday season in full swing, I thought it would be great to look at some previous holiday outfits I’ve showcased and then talk about ways to freshen them up a bit. My motivation to get this post up? 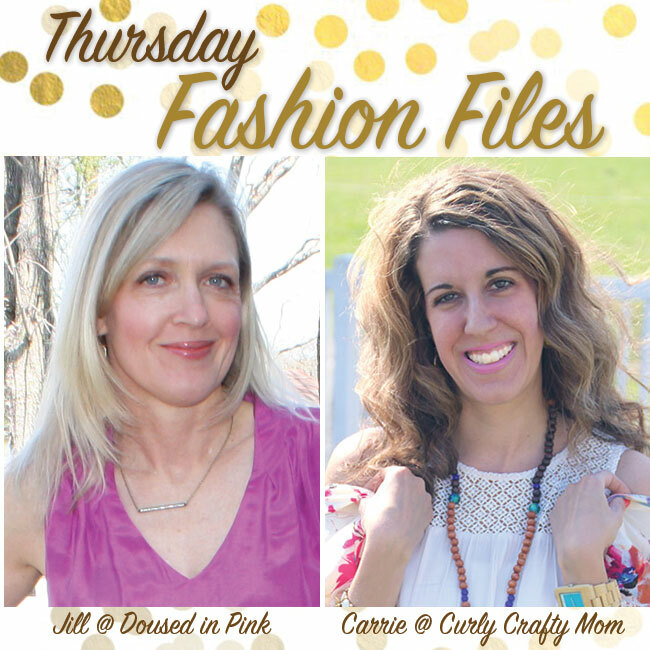 Being the guest co-host for the Thursday Fashion Files. 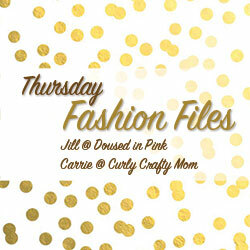 If you are visiting from the Thursday Fashion Files, welcome to Life Beyond Kids! 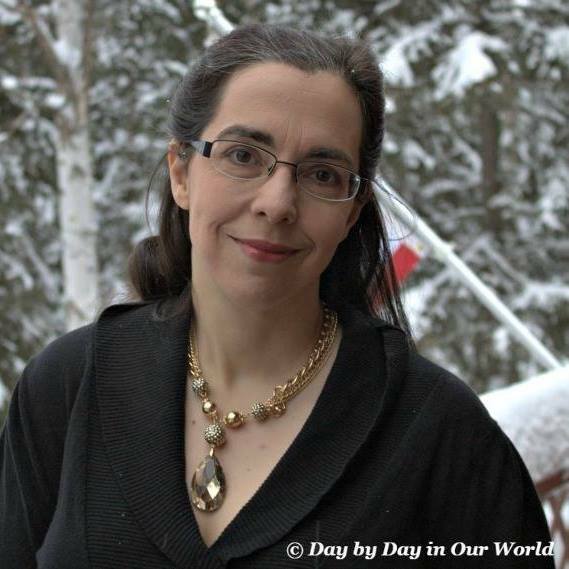 This is a newer site for me with a focus on women’s lifestyle that does not include the role of mother. When it comes to the holidays, I love to get dolled up and look my best. It doesn’t have to be super fancy, but it does need to be festive! These outfits appeared last year on my other site, Day by Day in Our World. The black sweater with a plaid skirt was an absolute favorite of mine. I’ve worn it multiple times, even after the holiday season was over. 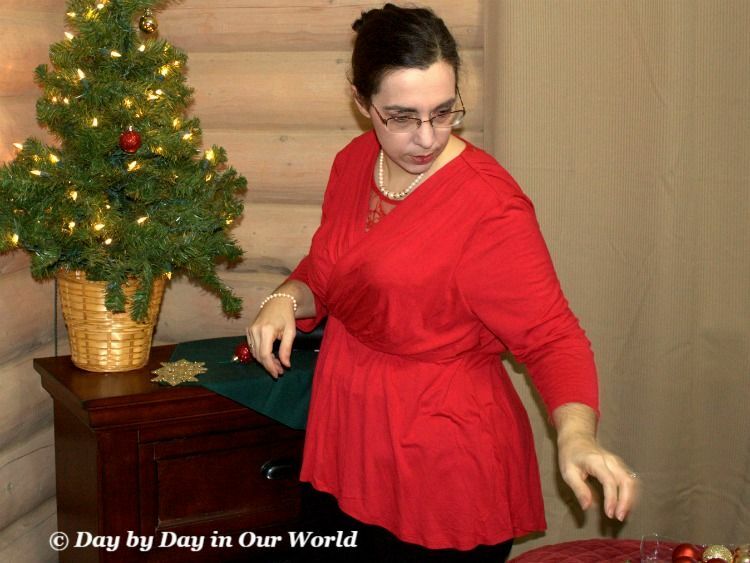 The gorgeous red blouse with lace inset is something I felt less comfortable wearing out of the house. From the front it seems fine. But, the backside has the lace panel going to your waist. While some might just let their bra straps hang out for all to see, I am not that kind of gal. A recent weight gain had my low cut bra no longer fitting as it did in last year’s picture. Here’s my solution: a black tank top underneath so that I can wear any bra and not feel super exposed. If I had a skin toned tank top, that would be my first pick. 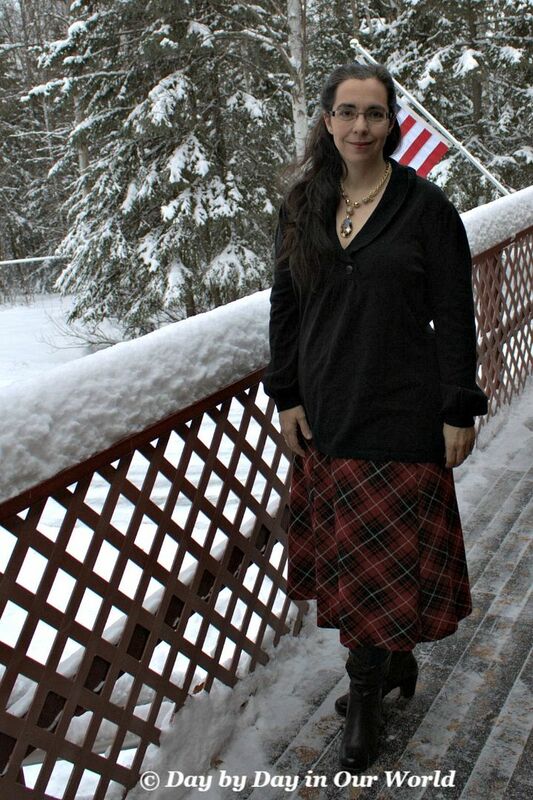 But, I find that the layering with black and a black skirt works for me. 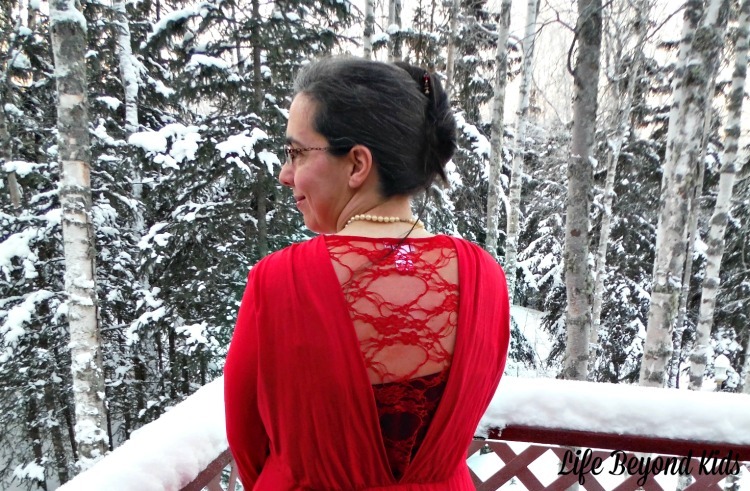 Finally, this red wrap dress is one that I originally used for Valentine’s Day. However, I think the red works well for this season, too. Lovely holiday outfits. I especially love the red dress. Thanks for co hosting! Thanks, Amy. I love that dress, too. It is a color that really pops on me. Red is for sure your color. It looks great on you - not many people can really wear it well. I look like a dead person when I put it on! Wear it in joy! Thanks, Patty. I know that I also rock some Royal Blue and Deep Purple, too. Red is a funny color, though, as there are undertones that work for some and not others. Orange red is NOT my friend. But something more like cranberry and I look fabulous. That red dress looks great! I love wearing red clothes as well :) and 'tis the season for it too. I couldn't agree more. If I didn't look good with red, then I'd be hunting for some green to wear. I love that wrap dress. It is gorgeous. I love the way it looks on you. I think red is a good color on me, too. I have red hair, so it kinda goes good together. The back of that red top is everything!!!! I would pair that with jean and heels on the weekend for some fun!